It's Mother's Day and my Mum is very difficult to buy for, as I imagine many Mum's are, so I decided to go for a practical yet fun present. I bought a Birthday's board kit from Peakdale Crafts, this consists of a blank board, the letters to spell out 'Birthday', hooks, wooden discs, wooden hearts and several wooden decorations.The mini letters and stags were from my own craft stash. I painted the board and the discs with cream paint, the hearts with read and the letters with gold. I wrote each family members name and day of birth on the discs with Promarkers, the little hearts have her five grandchildren on. I then attached each one to the relevant month hook. 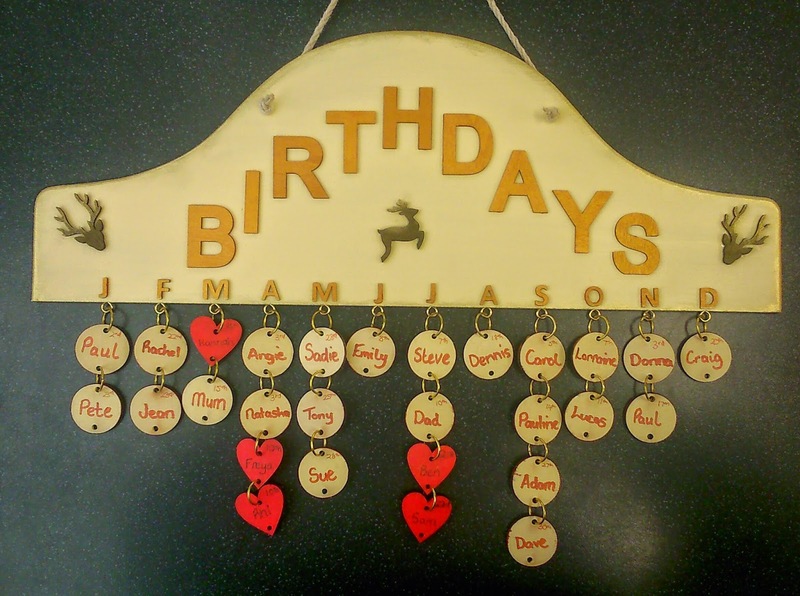 I then glued the letters of the month, the 'Birthday' letters and stags onto the main board. 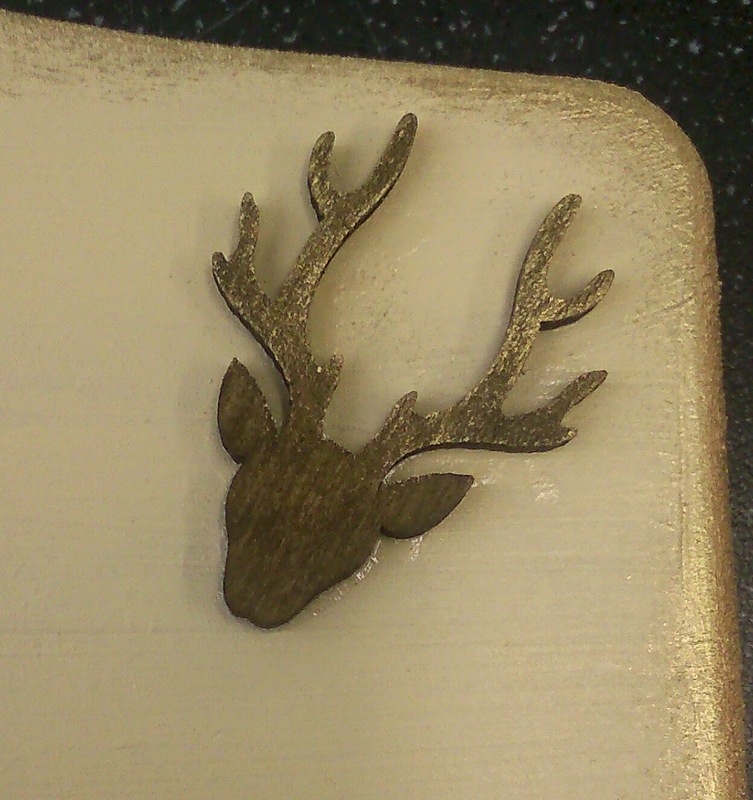 I then used gold gilding wax along the top of the board and on the stags antlers just to give it a bit of bling. Finally I added a bit of hemp to the top for a hanger and crossed my fingers she liked it, thankfully she did and has been proudly showing it off to anyone who visits. The sad thing was I had intended to pyrograph the names onto the bare wood but couldn't find my pyrography tool until after I had finished it (damn pixies again). This is actually my second attempt at the Wicked Witch from Visible Image's Wizard of Oz series, she's brilliant but I really struggled with her skin. The first one I did had really dark green skin but I just didn't like the finished look.So I decided to lighten her skin a little and I was quite pleased with the outcome (although these pictures don't do her justice). 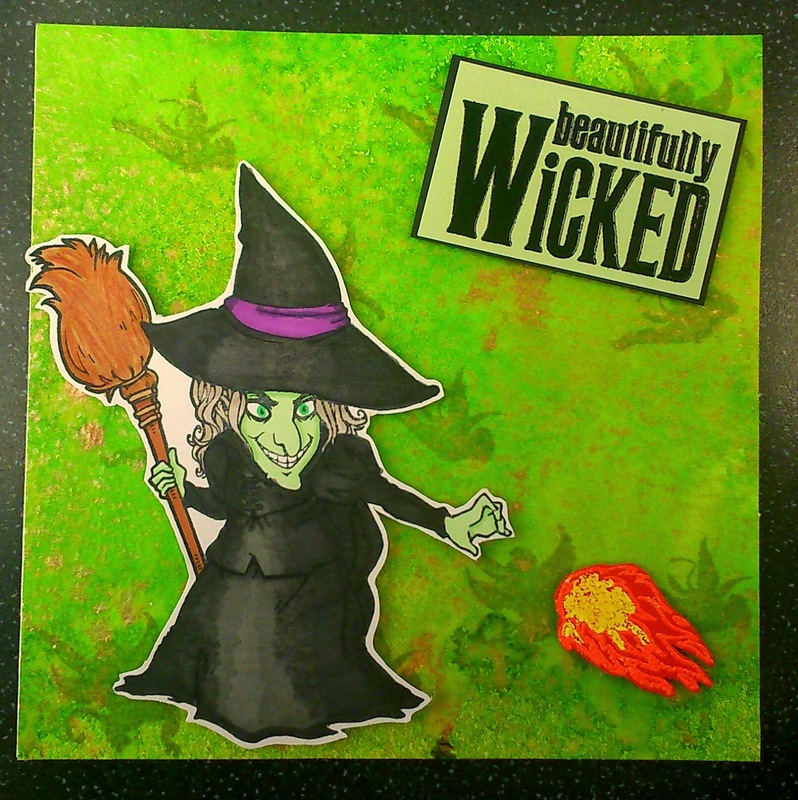 I stamped the witch onto white card and coloured her with Promarkers. I then stamped the fireball onto red card using Versamark and embossed it with orange Wow powder, I then used an embossing pen to colour the inside of the fireball to emboss using yellow Wow powder. 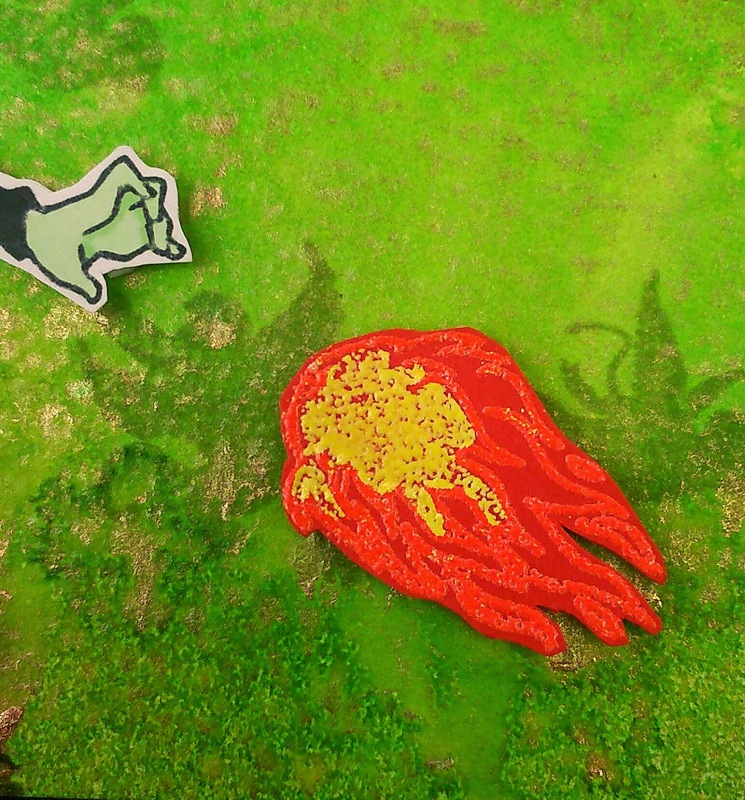 I created the background using several mica sprays and stamped the small flying monkeys onto it using grey Memento ink. 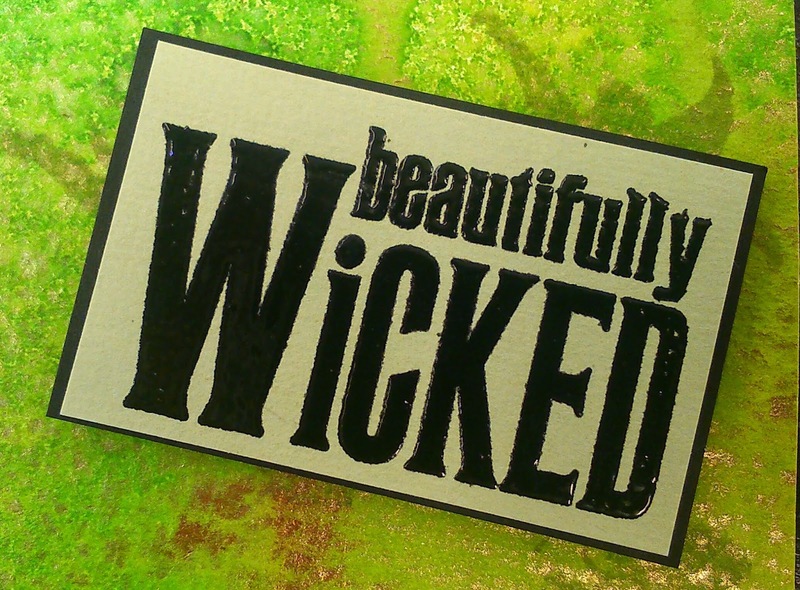 Finally I stamped and embossed the 'Beautifully Wicked' words onto card and mounted it onto black card. 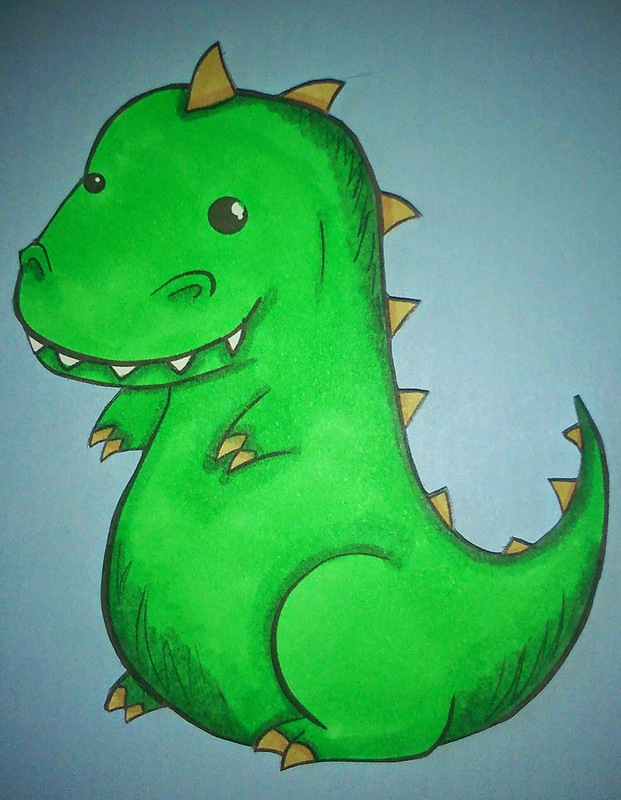 Ok so the title of this is a little fib, this little dino and his friends are just too cute for words. My friends little boy has a birthday next month and he loves dinosaurs so I finally had a use for both the digi and the punch. 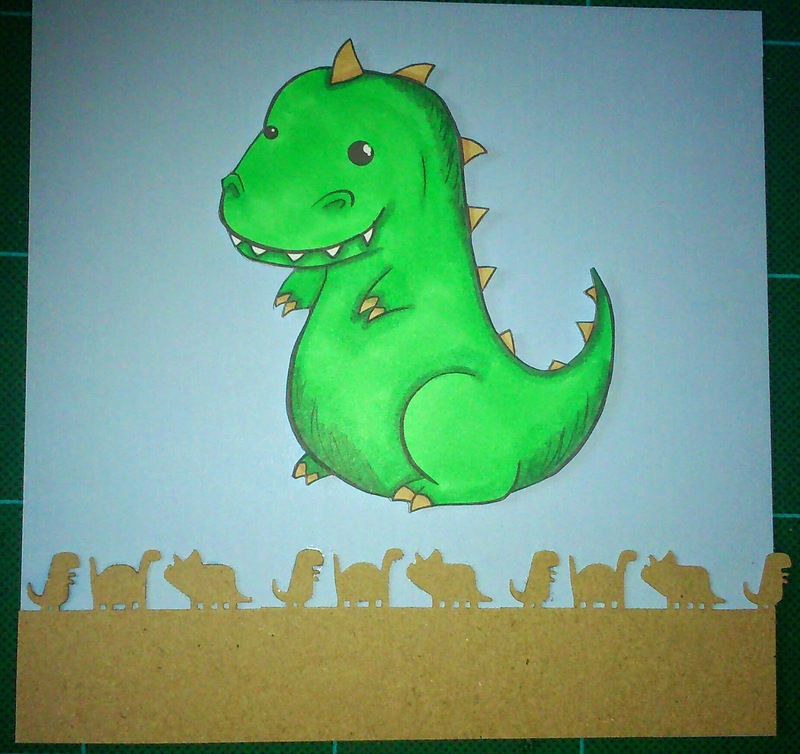 So I coloured the digi using Promarkers and cut the row of dinosaurs out in craft card. 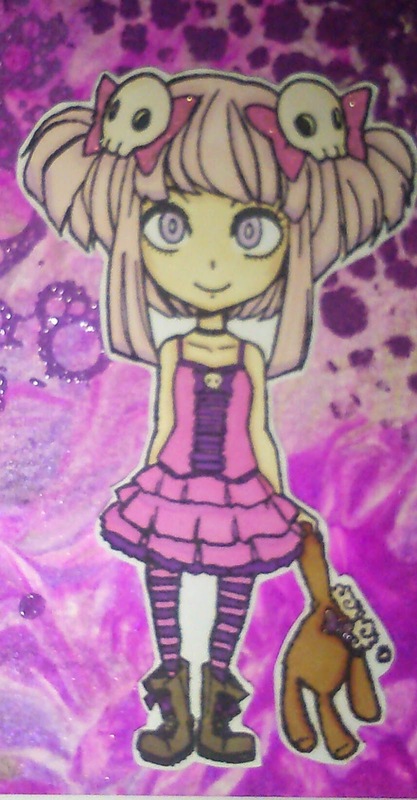 This is a card I made for my niece's birthday recently (she turned 14), I wanted something funky but still girlie without being childish. So Molly from Visible Image was the first stamp that sprang to mind, she is a brilliant stamp for a wide age range. Also the accessories are so useful and can be used with other sets from Visible Image. I created the background by putting white card onto shaving foam with ink on top, it doesn't matter how many times I do this I'm always amazed with what I get. 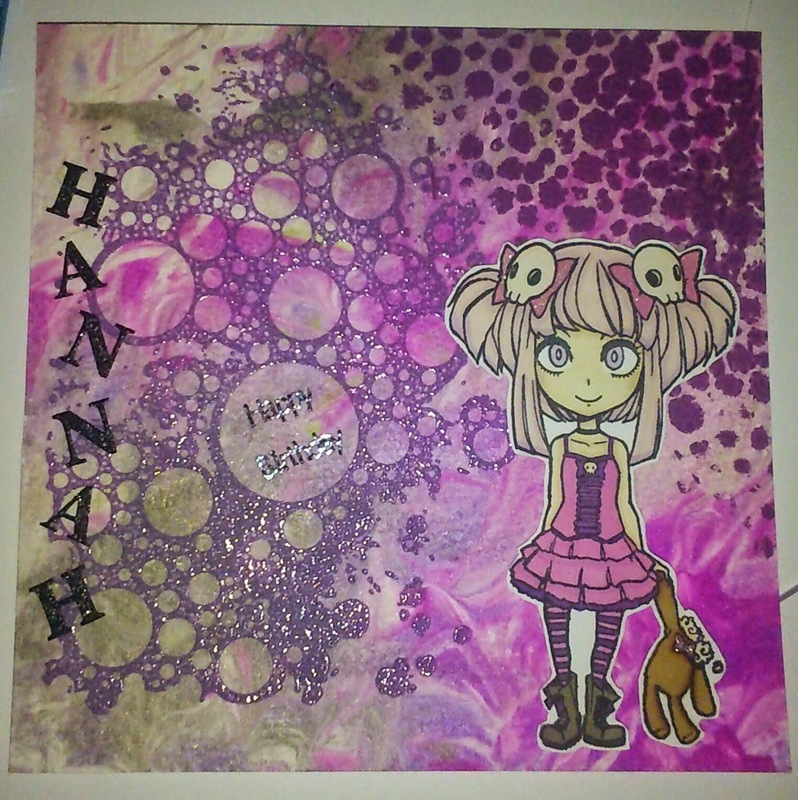 So onto this background I stamped the bubbles using an Indigoblu stamp which I embossed in purple. 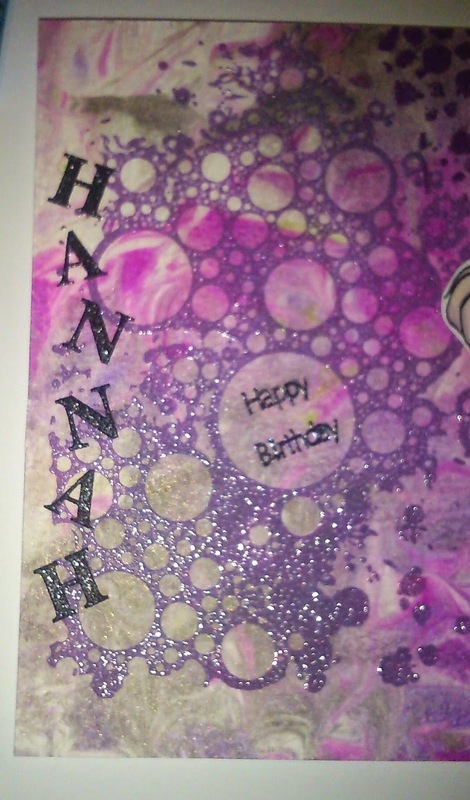 Added the Glitterations letters to spell out Hannah and added a Happy Birthday peel off to one of the bubbles. I used a spotty mask to add a few spotchy dots to the top right-hand corner in dark purple ink. Finally I stamped Molly onto white card, coloured her using Promarkers, cut her out and stuck her to the bottom right-hand corner. 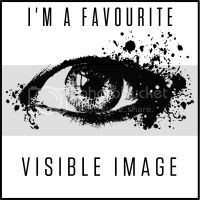 I know I seem to be an internet billboard for Visible Image but they are amazing, the images are brilliant and the stamps are really well made. So Frozen seems to be what is known as a Marmite film, you either love it or hate it. Personally I thought it was quite good, however I have twin girls who quite like their Disney princesses so I probably didn't have a choice. 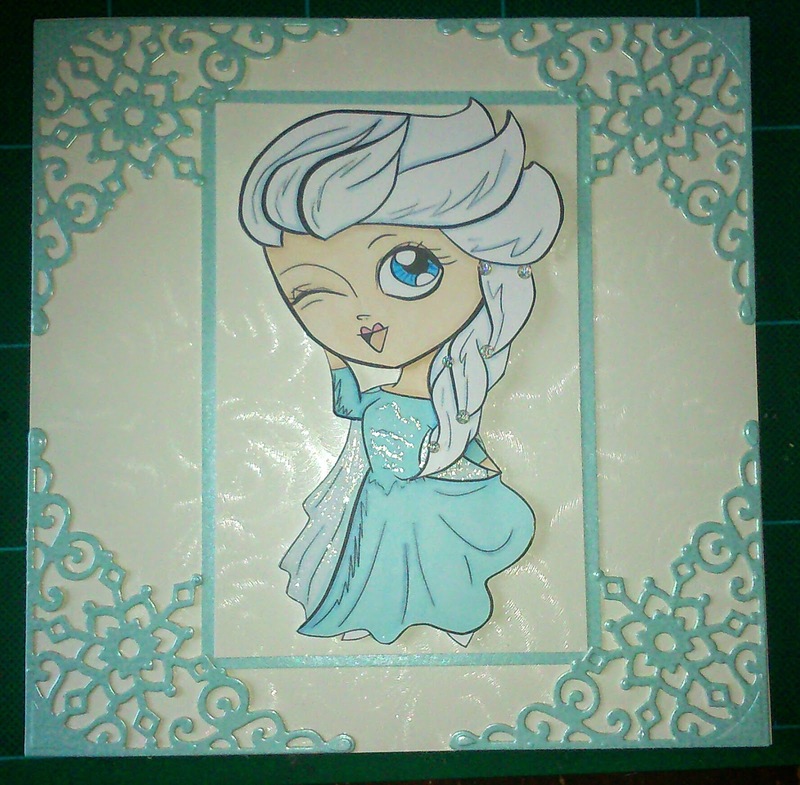 Well here is my Frozen/Elsa card that I made just because. 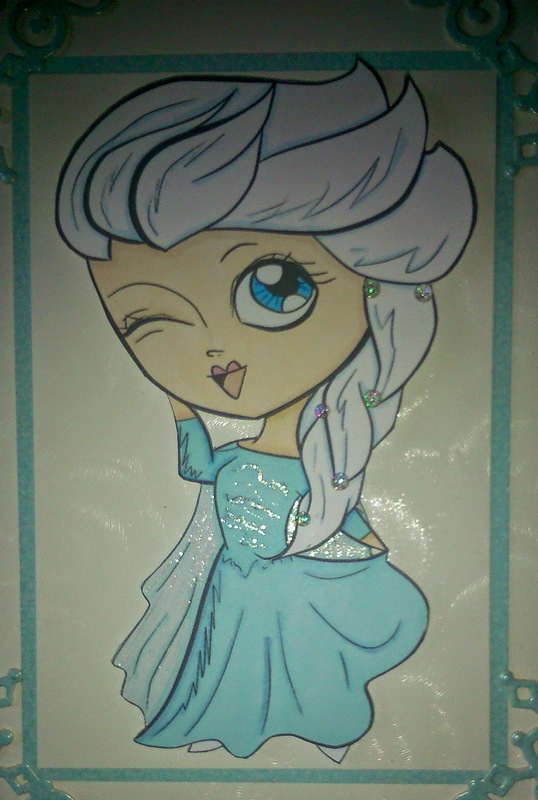 The image is a digi from Opal Manor, I coloured her using Promarkers, glittered her with a Sakura Stardust Clear pen, added a few glittery gems to her hair and cut her out. 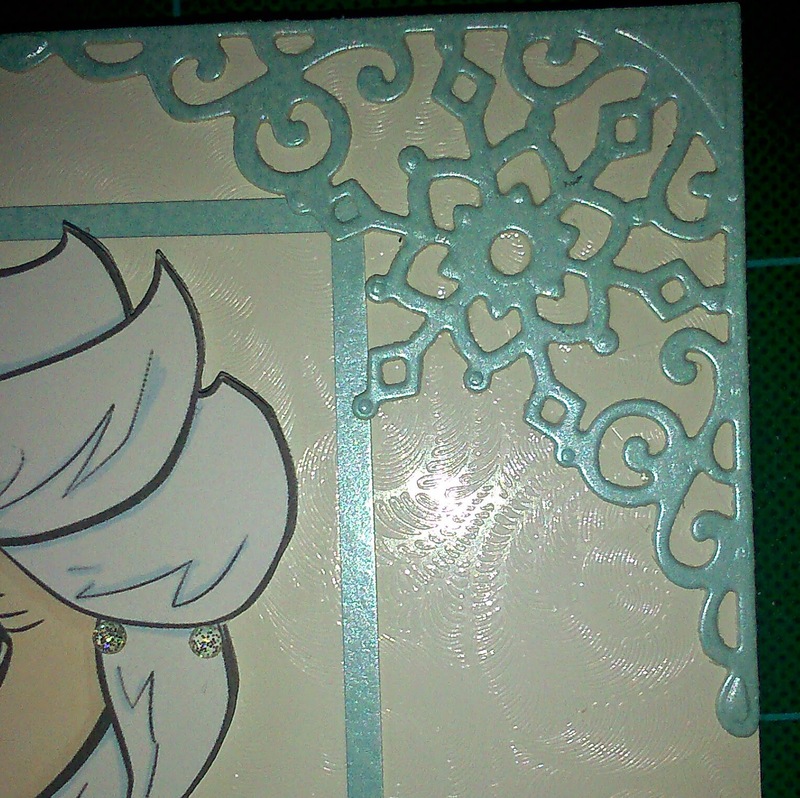 I cut out four snowflake corners in pale blue using a Sweet Dixie die, I really like this die and I'm pleased I've been able to use it for something other than Christmas cards. Finally I cut two rectangles of card one in the same blue as the corners and one in an embossed white (this is actually a rose pattern but looks a lot like snow swirls) and a square of the white for my background. I stuck the whole thing together and was really pleased with the end result.